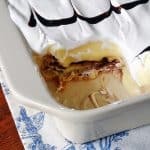 This eclair cake is one of those recipes that people have been making for years, just like my Pineapple Dream Dessert. Seems like everyone I mention it to has either made it themselves or their grandma or aunt or mom used to make it. It’s also one of those recipes that everyone loves and it never goes to waste. Every crumb and morsel is devoured, it’s just that good. 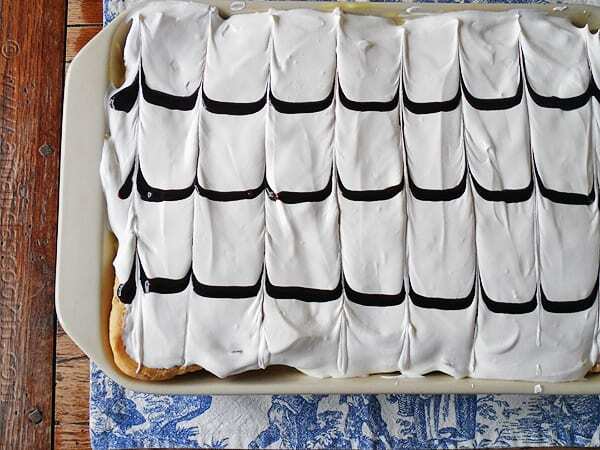 This eclair cake is one of those desserts that makes a person’s head tilt backwards, their eyes roll back in their head, and moans of pure enjoyment pass through their lips. I would call it purely orgasmic, but the kids love it too, so I think I’ll keep it G rated instead. Now I’m sure the calorie and fat count on this is ridiculous. So, if that’s a factor for you, maybe you shouldn’t make it. Or maybe you should, and factor in a piece then give the rest to a neighbor. Or, maybe you should make it and take it to the next barbecue you are invited to. I guarantee you’ll be the star of the afternoon. I actually had never had this eclair cake, nor had I ever heard of it before a few months ago. But, once I started searching around and reading comments and reviews (this cake recipe is posted just about everywhere), I realized that it’s definitely made the rounds over the years. I originally found it on Pinterest, which led me to a post titled Jean’s Cream Puff Cake. The pastry will bake up rather puffy and random. You can press the center down a bit to allow more room for the fillings. 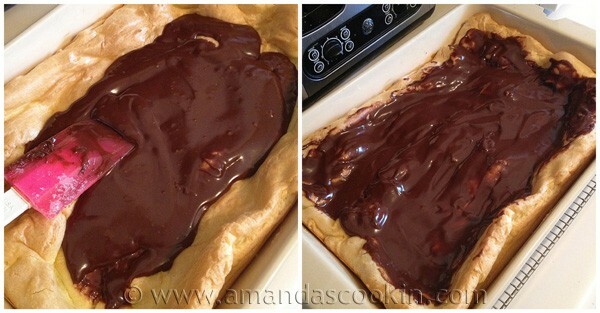 Spread the chocolate filling all over the pastry, then add the pudding layer on top of that. See how mine overflowed? I’ll admit I was wondering why at first, I followed all the directions. But, in the end, I didn’t care. It tastes that good. This amazing cake has a puff pastry based and is topped with irresistible chocolate eclair filling. 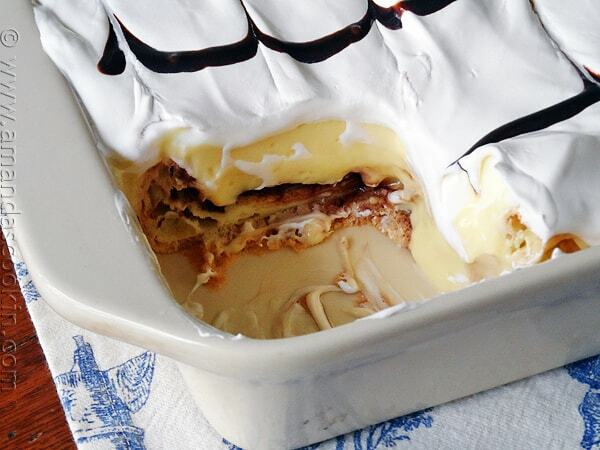 Cream Puff Chocolate Eclair Cake is always a hit! In a large heavy saucepan, heat butter and water to boiling over medium-high heat. Add flour and reduce heat to low. Cook and stir until it forms a ball and pulls away from the pan. Remove from heat and transfer to a large bowl. With a wooden spoon, beat in eggs, one at a time, beating well after each egg. Spread in bottom and up the sides of an ungreased 9x13 inch pan. Bake at 400 degrees F for 35 minutes. Cool completely. Melt chocolate and butter in the microwave on high for 1 minute. Stir. Continue heating at 20 second intervals until smooth. Stir in vanilla. Sift in the powdered sugar, a little at a time, stirring as you go. Dribble water in to the mixture until smooth and spreadable (you may or may not use all the water). Spread over the cooled pastry. In mixing bowl beat the cream cheese until fluffy. Slowly and gradually add the milk while still beating. Once these are well combined, add dry pudding mix and beat until thickened. Spread over chocolate layer in cooled pastry. Top with whipped topping, and draw lines of chocolate syrup across the top, then run a knife down the top in the opposite direction of the syrup lines, about every 2 inches. Keep refrigerated until ready to serve. This is a wonderful and easy recipe. It was a huge hit at a recent gathering. I did change a couple things tho. 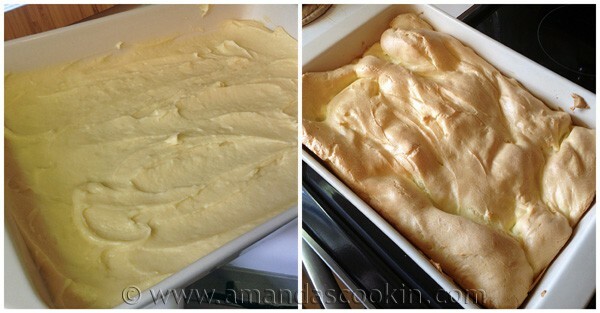 There is a recipe for ‘Pastry Cream’ which eliminates the need for boxed pudding and it works beautifully well. I also, never, use cool whip for anything. Using heavy whipping cream is so easy~ use 1 cup, beat with 1/2 cup sugar along with a pinch of Cream of Tartar to help the whipping cream retain it’s peaks and lastly 1/2 to 1 tsp pure vanilla. I have had requests for the recipe which I gladly provide. 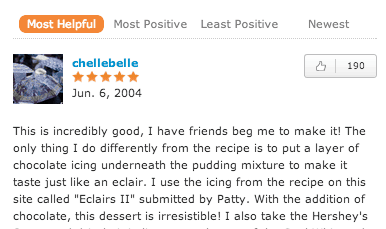 Thank ‘you’ for sharing this recipe with us. Thanks Anna! So glad you enjoyed it so much, it’s one of our favorites! Should try this! Thanks for the recipe… usually i’m tried mini creampuff but this recipe was so new for me to try…thanks again. ? Be sure to let me know how it turns out! I do not like cool wip can I use regular cream. And regular chocolate pudding. You can certainly give it a shot, Pauline! I don’t believe it would make a significant difference. I’ve made this several times in the past, all only occasions that involve large groups of people. This is one of those recipes that haunts me at 3am on my night shifts lol. Hi,recipe is just great.I have a question. Can I use vanilla custard powder except than puddind powder.I never use puddind powder. Hi Mona. it totally depends on how the instructions on the custard powder say to mix it. For example, a box of pudding powder requires that you mix 2 cups of milk into it to make pudding. So for this recipe, we use two boxes of pudding powder and 4 cups of milk. I suggest preparing your custard according to the package directions, then replace the pudding and milk in my list with the prepared custard and add that to the cream cheese. I hope that helps, good luck! This dessert is AMAZING! My family gave it rave reviews at Easter dinner and it will be served at Thanksgiving. Why would one use a wooden spoon specifically? Since I use a calphalon pot to prep the butter & water, I then use a non-metal whisk when adding the flour, then after I’ve transferred to the (glass) bowl and start adding eggs, I switch to a metal whisk (b/c the other is too large). Nothing seems “off” with the batter — please explain. More importantly if there’s a mixing tool one should specifically NOT use. THANK YOU! P.S. And this recipe is incredible on so many levels! I’ve had this recipe bookmarked for awhile but just made it today. It came together really easily and tasted AMAZING! It tastes just like an eclair. My fiancé knew he would be going back for a second piece after the first bite, and he did! Thanks for sharing. That’s great Megan, so glad you both enjoyed it! Can I use salted butter. I never use unsalted. I do not use unbleached flour can regular flour be used? Thanks. I made this today for Easter dessert. I am not a baker. So the easier, the better. This was really easy and fun to make. Mine looked just like the pictures! And I got RAVE reviews!! I was really proud of myself. Thanks for the great recipe! I just made 2, 1 for my family and they just loved it!! and the other I am taking to my BUNCO club today!! yeay can’t wait for my friends to taste it!!! 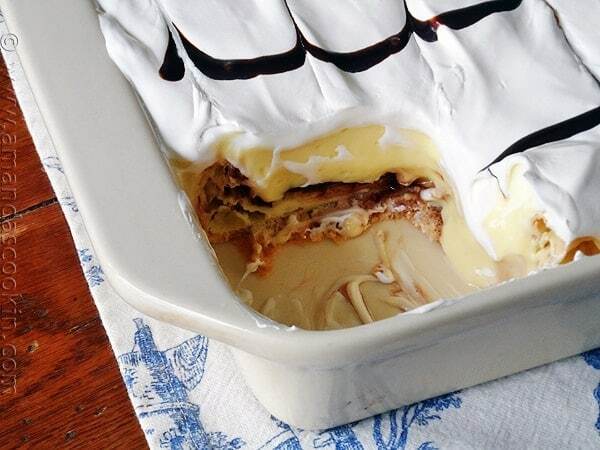 The Cream Puff Chocolate Éclair Cake, could you substitute Banana pudding and put a layer of banana in before you put the pudding over the cake. This sounds yummy. Hi Ash. I do have a homemade vanilla pudding mix at the end of this post -> https://amandascookin.com/2009/11/amandas-espresso-chocolate-pie.html if you want to try that. Amanda will using your vanilla pudding mix work? I have some in my pantry. I can’t get CoolWhip here in Australia but I see someone asked if whipped cream would work. I am 70 and never seen this recipe before. This can be lightened up in a couple of ways. Use Neufchâtel cheese – it’s usually 1/3 the calories and fat and basically same taste and consistency. Also, use sugar-free/fat-free instant pudding. It’s a staple in my house cause I have a notorious sweet tooth and tastes great. Of course use fat-free milk, and also use light cool whip. I don’t use the 0-calorie cool whip cause then it’s all chemicals, but the light has excellent flavor and consistency. So you can cut a lot of calories but keep all the flavor. I use these tricks all the time and no one can ever tell. I have made this numerous times, although I sprinkle two crushed Heath bars over the drizzled chocolate on top. I never have to worry about taking any leftovers home! So did this as a demonstration for my foods class. They get to make it as practice next week in preparation for the Cream Puff Lesson. Turned out awesome for puffiness but I needed to take the dough further up the sides to hold the filling. At least my students will not be making the same mistake! We are halving the recipe because six 9×13 pans would just be too many. So I will let you know how it goes. Awesome, hope it turns out! for the past 20 years I’ve had this and this alone for my birthdays, as I’ve yet to find a cake I like more…..though always used a kinda family recipe which calls for a raw egg in cream part lol. Used your recipe though for the 3 birthday ppl this week (I work in a deli that is side by side with a bakery), lol mostly women work there and they ended up giving me a group hug. I have had this recipe for years, it was called Moon Pie then. No matter the name, it is YUMMY! I haven’t tried this recipe. I have, though, tried the eclar cake and really liked it. I will be doing this one soon for a family gathering soon. Thank you, I will continue to use your recipes. Thanks .. Godbless you! Hi Johnnie! 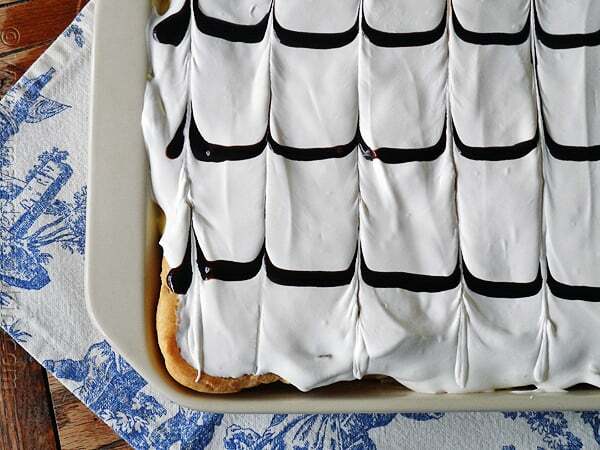 Eclair cake is definitely a good one too. I hope you enjoy this one! Hi Amanda! I just tried this today. Look here to see it! It is a great succes! I did’t use cream cheese, but I used a puding instead! it looks wonderful Flory! I am so glad you enjoyed it! Although I don’t like chocolate, this looks good. I’ve made the cream puffs before but have never tried them with chocolate filling. Thanks Sue! It’s one of my favorites! Keep it moving if you don’t get it, but don’t make some chef/person feel harassed….Please. I personally, thought you gave “many, excellent examples of how to make several options out of what one receipe expertise called for. It was a good easy for you to learn, and if you didn’t catch onto the expert receipe then you should none onto an easier blog. I should have added that I have the cream cheese out on the counter warming to room temp so I can make this. I am anticipating a very light dinner tonight. I can see changing the flavors, how about chocolate pudding or lemon pudding and instead of the chocolate frosting, use lemon curd? This puff pastry is the easiest thing in the world to make and you can do so much with it. I don’t see why not Rose, it seems very adaptable! Amanda, in reading the comments you stated there are no dumb questions but there is one really “DUMB QUESTION”! It is the question that goes unasked. Could you please help me with a couple of things here. I am new to this and am not sure about how to prepare the dough. When adding the butter to the dough do you mix by hand or with a mixer? Also! When preparing the cream filling, do you add the pudding mix right from the boxes, or prepare it first, as per directions on the box? Help! I’m new at this. Do you add the butter to the pastry dough by hand, or while using a mixer? Also! For the cream filling. 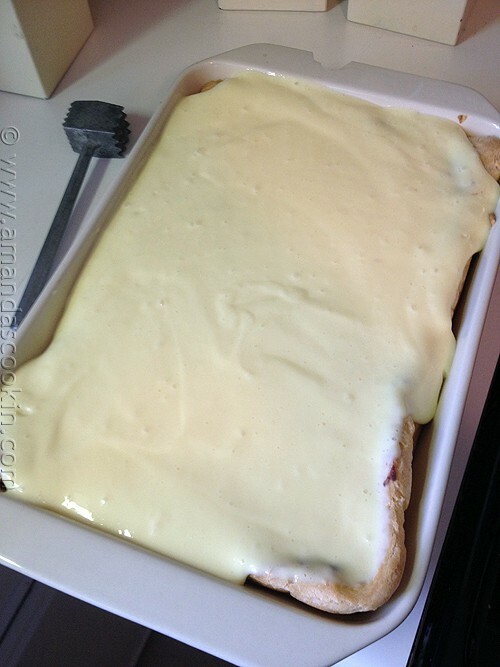 Do you prepare the pudding as shown on the boxes, or do you just add the dry pudding mix to the milk and cream? Sorry if these are dumb questions, but I don’t want to mess it up anymore than I probably will. Hi! Just wondering if you need to let the butter/water/flour ball cool at all before adding the eggs to it. Oh that sounds wonderful Swan! I don’t care for instant pudding, it never seems firm enough. I use cooled cooked pudding. I add a bit of Almond Extract to Vanilla pudding after it has cooled. When using instant pudding for my eclairs, I use the recipe on the side of the box for pie filling ( less milk), it is a lot firmer. Do you think you could use almond milk instead of cow milk? I’ve made non-dairy custard before with it (using an egg yolk and corn starch), but I’ve never made pudding. Sounds wonderful but wondering about homemade whipped cream. Anyone tried? I used homemade whipped cream; I always think that’s a better choice and it only takes minutes to make! It was delicious! Homemade whipped cream is perfect for this :) So glad you liked it! I increased the semi-sweet chocolate by half and cut the powdered sugar by 1/3 for the chocolate filling. Instead of Cool Whip, I used a block of Philadelphia Cream Cheese, a pint of heavy whipping cream, 1/4c powdered sugar and 1t vanilla (just beat it all till it’s stiff. The cream cheese stabilizes the whipped cream. Good for frosting cakes too). I have died and gone to calorie overload Heaven and am, from here on out, wearing only sweat pants and stretchy clothes. It was the puff pastry – oh, the glorious, glorious puff pastry – that lured me with its siren song. I was a goner after that. I’m not sure if I should thank you, or curse you. But I’m definitely going to have my cake and eat it too! Nice! But what size “block” of cream cheese? The big 8-ounce or small 2-ounce ones? I just came back from FL where I spent a month with my dessert Chef son Stephen. We worked together on making desserts and have a ball. I’m back home in GA now, and went wild when I saw the Cream Puff Chocolate Eclair Cake recipe you posted. It looks easy and most of the ingredients are staples so am going to also share with my other children and all my new neighbors in Buford, GA. Thanks so much. I didn’t change a think and it was super easy and delicious! I even was able to make it while my 1 yr old grandbaby was here visiting! Awesome to hear Cathi, so glad you enjoyed it! To use–For a standard Eclair you would pipe the custard into the center using a piping bag—zip bags prob would NOT hold up to this. OR you can carefully slice OFF the top using a serrated knife; fill; and then frost with chocolate for a traditional Eclair. For a Cream Puff you can again pipe the filling in or slice off the top OR you can slice in half and have TWO cases! You can also use any other filling for sweet cases–ice cream; cheese cake fillings; pie fillings—endless! The only “trick” to these is when you remove them from the oven you WANT them to cool and lose their steam–so pierce the side with a sharp knife just a bit and lay them on their SIDES to cool on a rack. Great info and tips, thanks for sharing Comet! This looks delicious, I;ve seen it in the Amish Bakeries. I never purchased it because I don’t like pudding. Can it be made withy custard instead? I really don’t see why not Regina! However, I believe custard packages are cook and serve. This recipe calls for instant pudding. So you would need to adjust accordingly. My thought would be to prepare the custard, and then if you wish, add cream cheese to it after it cooled. You could probably leave it out and it would be fine too. I’m not much of a baker so can you use frozen already made puff pastry? Hi Peg. I’m sure you could! Just follow the directions for the pastry on the package and then go from there. Should be fine. I was wondering the same thing, the easier the better for me!! 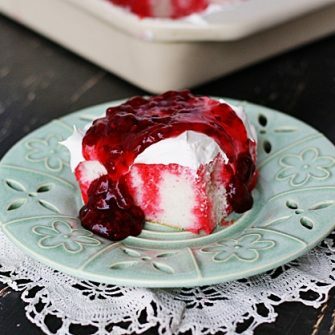 What about prepared bavarian cream?? I believe u can get it in bulk, used to anyway!! Again, I don’t see why not! Thank you Amanda, I’ll give the cottage cheese a try. Awesome, hope it works out! To make it even more of a chocolate eclair, I’m thinking maybe I could either double the recipe or put in two smaller pans using one for the top and then adding the custard filling from my other choc eclair recipe (the one with the graham crackers) which is french vanilla pudding mixed with coolwhip and then put an actual chocolate icing on top instead of the syrup- what do you think? Anything with pudding sounds good to me! I say go for it and let us know how it turns out! Does anyone ever make anything like this without cream cheese? I hate cream cheese and won’t make anything that has cream cheese in it! Hi Linda. I am not speaking from experience with this, but I’ve heard you can puree cottage cheese and use it as a substitution (equal measurement to the cream cheese). I’ve also heard the Greek yogurt or plain yogurt strained over night through cheesecloth will work too. Thanks for the hint! I hate cream cheese too, but I like Greek Yogurt so I’m definitely giving this a try! You could use mascarpone cheese instead. It’s creamier than cream cheese and has a different flavor. I use it in place of many things, cream cheese and ricotta are 2 expamples. I make this and it is very good. You do not need the cream cheese. Just do the instant pudding with a little less milk. The pudding box has a recipe for making it for pie and it sets up just fine. I used to make cream puffs all the time. For the filling I used a French Vanilla cream filling (like pudding) from my Betty Crocker Cookbook. It was heavenly! I haven’t done it for years now that my children are grown and gone. Time to try it again. So pretty! What a great dessert. Perfect for company! Printing this for the next time I have visitors! Thanks Kristin! It’s definitely a keeper! My mom makes this for family dinners all the time, and everyone loves it. We call it cream puffs in a pan, though. I like the chocolate eclair cake title better. Maybe I can get all 45 of us to buy in? OMG…so I must be one of the few who has never made or heard of this masterpiece! Must make over the summer…thank you lady! I’ve never made this with puffed pastry, we always use graham crackers but wow, I bet it really does taste like eclair with the puff pastry! looks good! what a great recipe. 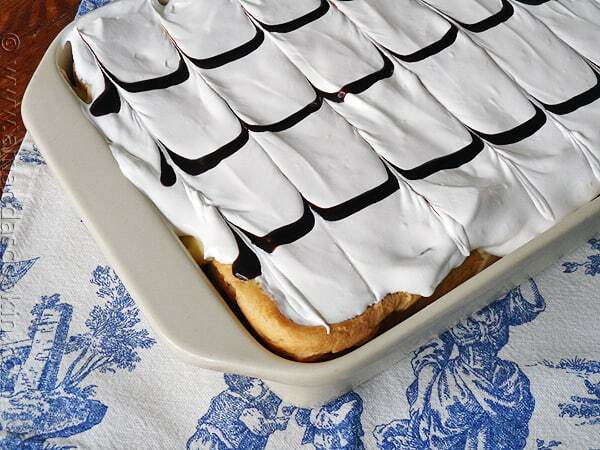 I’ll probably never made actual eclairs, but making a cake version is right up my alley! So glad you shared.